Latest election poll from Haaretz sees Labor-Hatnua once again in the lead, with 24 mandates - three above rival Likud. A new poll from Haaretz shows a solidification of a trend that has been developing over the past several days – Labor-Hatnua taking the lead in next week's elections. In the poll released Thursday, the party, led by Yitzhak Herzog, comes in at 24 seats, while Likud, led by Binyamin Netanyahu, follows with 21. Thursday's poll differ from a poll taken Wednesday by Army Radio, which showed Likud and Labor achieving the same number of seats. With that, Labor's lead is anything but decisive, as they would have no more than 20% or so of all the Knesset's seat. 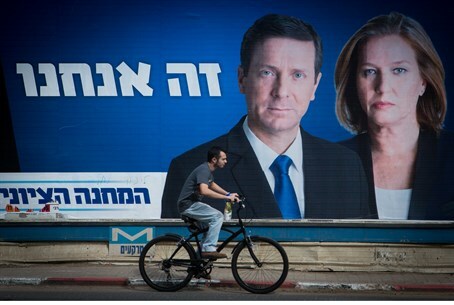 However, a three seat gap, as seen in Thursday's poll, would probably be enough to convince President Reuven Rivlin to appoint Herzog to attempt to form a government, even if the traditionally right-wing parties could form a bigger bloc. In Thursday's poll, the third largest party is the Joint Arab List, with 13 seats. Yair Lapid's Yesh Atid comes in at 12, while Kulanu and Jewish Home poll at 11. Yachad -Ha'am itanu, which has presented itself as a “more religious” alternative to Jewish Home, polls at five seats. Shas comes in at 7 seats, while United Torah Judaism gets six. Meretz also received six seats, although other polls have shown the far-left party with as little as four mandates.